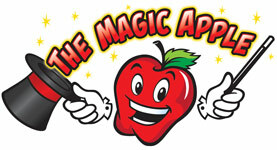 The Magic Apple will not take back returns of any and all magic supplies. Once you have bought a trick, it is yours. Magic is all based on secrets and sometime the secret is VERY easy and something you can make on your own. We can only suggest, put it on a shelf for a few months, practice other magic and then try again. If there is a defect in the item, as long as it is still available, we will replace it with the same product. Prices are subject to change without notice.